Tamil-Seychellois are people of Tamil ethnic origins living in the island nation of Seychelles. Their population is roughly estimated to 4000, making them one of the island's significant minorities. Tamil immigrants arrived in Seychelles as early as 1770, and the Tamils were among the first settlers to the originally sparsely inhabited island nation. Traders from the French colony of Pondicherry and later traders from present day Tamil Nadu, visited the islands for trade in Timber and later a trading community was in place and many of the Tamils got integrated with the local population. 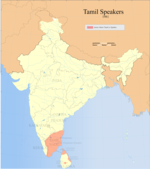 In 1901, there were roughly 3500 were Tamil-speakers out of the country's population of 19,237. The Tamils constitutes the majority of the Indo-Seychellois who form 6% of the total population. Overall it is believed that over 10% of the population of Seychelles has some Indian roots. Hinduism continues to thrive as an important religion among the Tamil-Seychellois, according to the 2001 census there were 1,600 Hindus in the country. The Seychelles Hindu Kovil Sangam was founded in 1984. The annual Kavadi festival is a major event which is a government holiday for all Hindus. Cultural troupes are invited from time to time to enhance cultural values and links. The organization of the Seychelles Hindu Council, celebration of Deepavali festival on a national scale and the setting up of a crematorium with government support are events worthy of note. There is also a Hindu Council of Seychelles established and maintained by the community. The Arulmigu Navasakti Vinayagar Temple in Victoria, the first and the only Hindu temple in Seychelles, has Lord Ganesha as the presiding deity. Apart from the presiding deity, icons of Murugan, Nadarajah, Durga, Sreenivasa Perumal, Bairava and Chandekeswarar are enshrined in the inner mandapam of the temple. Prayers are performed for the different deities on special occasions. Seychelles Tamil Mandram was registered in 2002. Since then it has been growing gradually, and very steadily through the support of Tamil community and dedicated committee members.The purpose of this association is to promote interaction of Tamil community living in Seychelles Since 1770 , to cultivate and develop the advancement of knowledge in Tamil language and literature and the depth and the richness of the various literatures and to promote fellowships and to provide, organize and participate in cultural and social functions frequently.Annually two programmes are organized by Tamil Mandram, Pongal festival in January commemorating Pongal celebrations by bringing scholars from Tamil Nadu to give speech and exhibit international and locally organized cultural performances. Aadi thiruvizha is celebrated in Seychelles by Seychelles Tamil Mandram in the month of September to commemorate Aadi Month which is an important month for agriculture. During which Drawing, essay, oratorical competitions and traditional games are conducted and prizes are distributed.Tamil Mandram organises Tamil classes in the name of Seychelles Tamil School on Sundays at Mont.Fleuri Primary School since October 2013 and students of different nationality including India, Sri Lanka, Seychelles, Mauritius and Canada attend classes and get benefitted.Active participation in Tamil classes, debates, dramas and other cultural events including Tamil publications has increased over the years. ^ a b "murukan.org". Retrieved 9 September 2013. ^ "Indian Diaspora Africa" (PDF). Archived from the original (PDF) on 8 April 2014. Retrieved 9 September 2013. ^ "murukan.org". Retrieved 9 September 2013. This page was last edited on 1 September 2018, at 13:36 (UTC).